Current methodological research has found that in order for learners to acquire language that is both linguistically accurate and socially appropriate, their awareness of patterns and of what is systematic about language must be developed. In "Discourse Analysis in the Language Classroom," Heidi Riggenbach has compiled activities that will foster this awareness by putting students in the role of discourse analysts and language researchers so that they may learn the patterns and systems for themselves. This book is intended for ESL/EFL teachers who wish to have a better understanding of discourse analysis as it applies to the language classroom and who need to design courses and materials with the goal of developing students' skills as researchers in acquiring their new language. 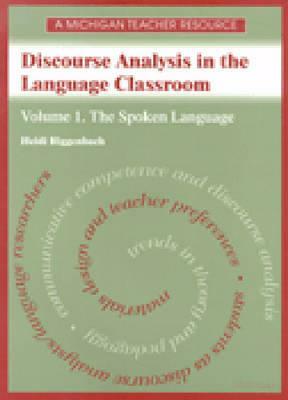 The book includes: an overview of discourse analysis and its relevance to language teachers and learners; background material on the interesting features pertaining to oral language skills; presentation of techniques for preparing students to be researchers and for implementing discourse analysis tools in the classroom and the activities that employ these techniques; and a discussion of options for incorporating discourse analysis into different course situations. Description: illustrations 232 Current methodological research has found that in order for learners to acquire language that is both linguistically accurate and socially appropriate, their awareness of patterns and of what is systematic about language must be developed. In "Discourse Analysis in the Language Classroom," Heidi Riggenbach has compiled activities that will foster this awareness by putting students in the role of discourse analysts and language researchers so that they may learn the patterns and systems for themselves.